The first stop on the international leg of my journey was Israel, it seemed fitting as I was born an Israeli citizen and traveled to the place half a dozen times growing up. Israel also happens to be a particularly good place to go to study Parkinson’s disease as Ashkenazi Jews are more likely to develop it than most and are much more likely to be carriers of mutations associated with PD. Add to that Jewish neurosis and ingenuity, plus the Israeli penchant for cutting right to the chase, and you have a potent mixture of ingredients needed to combat this disease. I had heard countless stories of the industriousness of the Israeli people and the pioneering spirit that turned this country from a desert outpost just 69 years ago to a thriving hub of high-tech and biomedical technologies today. Now, having visited nearly every major research center in the country and seeing some of that ingenuity for myself, I too can’t help but marvel at the staggering amount of innovation going on in this tiny land. I began at Ichilov Hospital in Tel Aviv, where I met Dr. Tanya Gurevich, the director of the nations largest Parkinson’s disease program, and Dr. Avner Thaler, a spirited young researcher playing a leading role in some of what is going on there. Ichilov is also a center for a number of clinical trials, most promising among which are those for genetic cohorts of the disease such as LRRK2 and GBA carriers. For those ‘lucky’ enough to have one of these mutations there is good news as the first batch of clinical trials targeting those genetic variations are set to begin soon and Israel will be one of the global hubs for these trials. For a long time it was suspected that genetics played a prominent role in this disease, now we are on the brink of therapies targeting them. If they are successful it will tell us a lot about the underlying mechanisms of the disease which could have benefits for all people with PD. Another particularly innovative therapy developed at Ichilov uses virtual reality as a therapeutic tool. The program, designed by Dr. Anat Mirelman, uses a treadmill and a motion capture camera and asks patients to navigate a virtual world while stepping over obstacles and completing cognitive tasks. One of the biggest challenges for people with PD is summoning up the motivation needed to go out and do the exercises required. PD makes exercising even more strenuous as sometimes simple tasks like raising your foot can be challenging. The novelty of the virtual world and the sense of presence experienced through VR makes some patients more eager to exert themselves. Devising such innovative approaches to physical therapy will go a long way towards improving the quality of life for people with PD. While in Tel Aviv I also met with Igal Raichelgauz and Karina Odinaev who would later introduce me to Dr. Josh Zeevi. Together they comprise the founders of Cortica, an artificial intelligence company. AI research has come to play an integral part in helping us understand the brain, not only does it allow us to better parse the mountains of data neuroscience creates, but attempts made in AI research to mimic the brain have revealed novel theories about how our brains process information. At Cortica they are attempting to get machines to see the world as well as we do by trying to reverse engineer the human visual cortex. Now they are applying their patented imaging technology to analyze medical data more accurately than any human ever could. I next traveled to Jerusalem to visit Dr. Hagai Bergman at Hadassah Medical Center who is a world renowned pioneer in deep brain stimulation. Now he and a company called Alpha Omega in Nazareth are developing the next generation of DBS that will be ‘self driving.’ Rather than surgeons having to implant the devices themselves and take painstaking efforts to ensure they hit their one millimeter wide target in the brain, his team is developing a device that will ‘drive itself’ with far more precision than the human hand. They will also make use of new closed loop devices that will be able to read brain activity and fire accordingly, adapting to the constant changes in the brain. This will be a huge improvement over the current devices that are always on regardless of what the rest of the brain is doing. While in Jerusalem I also met Dr. Nissim Benvenisty at Hebrew University who has pushed forward the limits of biology through the development of human haploid embryonic stem cells. These cells are similar to sperm and egg cells in that they only have one pair of chromosomes, but unlike sperm or egg cells these can divide and be turned into any cell in our body. This makes for much better models when studying diseases, particularly those involving known genetic mutations. He is currently working on a disease called fragile X syndrome but believes haploid cells will eventually be applied to the study of a wide range of diseases, including Parkinson’s disease. I also had the chance to visit Tikvah For Parkinson’s while in Jerusalem, an organization founded by the inspiring writer and grandmother of 53, Debbie Shapiro. After her own diagnosis she noticed that there was no place in Jerusalem offering a full package of therapies for people with PD so she started one herself. Tikvah for Parkinson’s is one of the best patient centers I have come across, offering tai chi, speech therapy, physical therapy, exercise programs, art classes, and more. More importantly it has created a community of people with PD who can lean on one another and learn from each other. One teaching from Judaism that I have found particularly useful in my own quest for knowledge about my disease comes from a commentary on medicine written by Maimonides. He was a 12th century Rabbi, physician, and philosopher, and widely regarded as the foremost authority on Jewish thought. “There is one [disease] which is widespread, and from which men rarely escape. This disease varies in degree in different men … I refer to this: that every person thinks his mind … more clever and more learned than it is.” I have met a few doctors and scientists along the way who could use a little of that humility. Next I traveled north to spend a couple days in Haifa visiting Technion – Israel’s Institute of Technology, where I met with Dr. Shulamit Levenberg and Dr. Daphne Weihs. Dr. Levenberg walked me through the elegant details of tissue engineering and 3D bio-printing, technologies that are in their infancy but have a wide range of potential therapeutic applications. One day they could allow us to grow organs from a host’s own cells for transplantation or regenerate damaged tissue anywhere in the body. Dr. Weihs’s work uses a new set of bio-mimicry materials that could enable oncologists to better understand the mechanics behind how cancer cells spread to the various parts of the body. Though neither of their work relates directly to the study of Parkinson’s disease, it is always invigorating meeting people on the cutting edge of their field and it helps give me some sense of where all this science is taking us. But I believe the really big breakthroughs will come from trying to see how the dots might connect between seemingly disparate fields and how that could lead to novel solutions for diseases like Parkinson’s. For instance, perhaps one day technology being developed at Dr. Levenberg’s lab could be used to regrow damaged tissue in the brains of people with PD, or possibly techniques being developed by Dr. Weihs could be adapted to help us better understand how Lewy bodies, toxic clumps of protein, spread to the various parts of Parkinsonian brains. Next I met Dr. Daniel Segal in Tel Aviv University to learn about the potential therapeutic benefits of Mannitol, which Dr. Segal and his colleagues found to be capable of preventing clumps of the harmful alpha-synuclein protein from forming in the brain. Mannitol is a natural sweetener that became quite popular in the PD community after Avihu Ben-Nun, former commander of the Israeli air forces, started speaking up about all of the symptomatic benefits he had received from it. However, it is unlikely that Mannitol will ever be used in clinics because of a problem endemic to how medicine is practiced. Physicians only prescribe treatments that pass clinical trials, but it takes years and usually tens of millions of dollars to run a clinical trial. Mannitol has already been classified GRAS(Generally Recognized As Safe) by the FDA and is commonly used as a food supplement, meaning there is no money to be made for any company that goes to all the effort of funding a clinical trial for it. There are still a lot of questions surrounding Mannitol that a trial could answer, such as what is the effective dose and what stage of the disease it might be most suitable for. Unfortunately we may never answer these questions because it is unlikely to ever go to trial. Mannitol is just one such example. A week rarely goes by that I don’t hear about some new therapy that supposedly works wonders. They are usually accompanied by articles from reputable sources and come with a variety of anecdotal evidence. Other examples include: intravenous glutathione, detox and cleansing regiments, meditation, various hallucinogenics, medical marijuana, ketogenic diets, bear bile, acupuncture, bee venom, music therapy, transcranial magnetic stimulation, hyperbaric oxygen therapy, and a variety of nutritional supplements. The problem is that some of those therapies might actually be beneficial but without a clinical trial it is difficult to say so with any certainty leaving patients with no other option but to try them out on their own, essentially conducting their own personalized and self funded clinical trial. Due to all the variability in Parkinson’s disease, each patient would need to experiment with each one in a controlled environment for a couple months to accurately identify what works best for them. It is a frustrating part of the reality that patients with chronic diseases face. However leveraging new tools such as citizen-science campaigns like CliniCrowd,which Dr.Segal and others are using for Mannitol, or recent advances in artificial intelligence and the blockchain may present some novel solutions that allow us to reform how clinical trials are run. While in Tel Aviv I also attended the Mixii Biomed conference which brought together dozens of experts for three days of lectures on a variety of health related topics. Much of the talk centered around the emerging idea that aging itself should be classified as a disease. A growing number of scientists believe we will eventually be able to understand and account for all the factors involved in aging and stop or even reverse all of the damage that accumulates in our bodies. The most prominent proponent of this is Dr. Aubrey de Grey, whose lab in the bay area I toured last November. After learning of all the new techniques to prolong human lifespan that have become available in the last decade or two, it seems possible that in the not too distant future we may hit what Dr. Grey termed the ‘longevity escape velocity’, a time when new techniques to prolong human lifespans will be made available at a rate that exceeds the speed at which people age, allowing us to perpetually stave-off aging. Some other very prominent scientists say this could happen within the next 10 years. Rapamycin, a drug shown to significantly increase lifespans in mice. Newly discovered therapies to clear senescent cells. One of the hallmarks of aging, senescent cells are cells found all over the body that stop dividing and start polluting their surrounding. New compounds to tackle protein misfolding. A long list of diseases, including Parkinson’s disease, are the direct result of protein misfolding. Extending or shortening telomeres – abnormal telomere growth is another hallmark of aging. Bone marrow transplants to treat mitochondrial defects which are known to be one of the key factors in cellular degeneration. A variety of stem cell therapies made possible by the discovery of IPS cells which can be used to regenerate just about any cell in the body. Several new immunotherapies to harness the body’s immune system to target cancerous cells. A much better understanding of the role nutrition and the gut play in health and longevity. The evolving field of epigenetics which studies the effect our environment has on gene expression and mutations. Better bioinformatic data coupled with a range of enhanced diagnostic tools could lead to new biomarkers of disease and new methods of detecting them before they become harmful. At the conference I also got to speak briefly with Dr. Nir Giladi, chairman of the Neurological Institute at Tel Aviv Medical Center. He gave a talk highlighting the need for early detection of various neurological diseases and the benefits to be gained from doing so. Many chronic diseases such as Parkinson’s only become symptomatic years or decades after the disease has started to form, ideally we would like to be able to identify and start treating them long before they become a problem. He spoke of a future where we would all have devices implanted into us that would monitor various bio-markers and would be able to give us much earlier indications of anything that might be going wrong. With all of these methods that could be available soon, it seems conceivable that at the very least we will be able to significantly extend human lifespan. 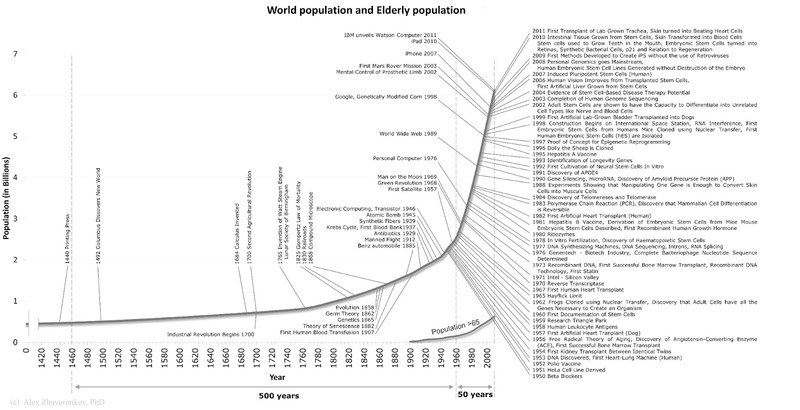 Medical progress in the 20th century improved average lifespan from roughly 45 to 80 years, if that trend simply continues, babies born today could live to be, on average, 120 years old. My next stop was Ben-Gurion University in the desert town of Beer Sheva. First I met with Dr. Rachel Lichtenstein, who, along with her masters student Hadas Nachumsohn, has redesigned an existing cancer drug to repair damaged microglia. Microglia are the immune cells of the central nervous system, they actively shape neuronal networks and when they stop working properly it triggers a cascade of problems that often lead to diseases. Rachel’s team is using this drug to tackle ALS and they have had stunning success in rodent models. But Rachel also believes the drug might be applicable to a wide range of neurodegenerative disorders, including Parkinson’s disease. This is because a wide range of diseases are due to the toxic buildup of proteins and enhanced microglia might be able to help clear harmful proteins which would stop further damage from accumulating. I then met Dr. Anat Ben-Zvi whose work focuses on a new field of biology called proteostasis. The field is based on the theory that cells have signaling mechanisms that promote the proper clearance of proteins. As we age these signals get switched, making it harder for cells to properly regulate their proteins. This field is now starting to learn how these switches get triggered and how we might be able to control this signaling. Dr. Ben-Zvi believes that over the next decade we will learn how to manipulate these pathways to our benefit. If true this will be an enormous breakthrough on par with the discovery of antibiotics in the 20th century as there is a long list of diseases associated with protein misfolding (including Parkinson’s disease) that will be essentially wiped out by mastery over these mechanisms. Finally, while in Beer Sheva I sat in on a guest lecture from Dr. Tal Dvir, a tissue engineering expert at Tel Aviv University. I was amazed by his presentation so I arranged to visit him in his lab later that week. His team uses new biomaterials that enable cells to grow outside of the body resulting in improved transplantation therapies and he believes these could make for better grafts in Parkinson’s stem cell therapies. He also thinks that in the future we will be able to use tissue engineering techniques to grow fully functioning organs, like human hearts, outside of our bodies. To date I have spoken at length with over fifty experts who spend their days on the frontiers of neuroscience and biomedical research; men and women teasing apart the smallest details of our biology and that 3 pound lump of goo between your ears that is responsible for everything you do, everything you feel, and everything you are. When I meet them I mainly ask them about their research, but I also try to get their sense of where we are in our understanding of the brain and where we’re going. One question I often pose is – say perfect knowledge of the human brain is a 100 yard race, how far have we collectively gone in this race? The consensus from those I have talked to so far is that we are right around the 10 yard mark. It can be a little deflating to hear that for all the progress we have made we have really only begun to understand our brains and the diseases associated with it. Though it does explain why we have been so unsuccessful in our attempts to fix what goes wrong, particularly in Alzheimer’s disease which has had about 200 drugs fail clinical trial. The reality is that we just don’t know enough about the brain to say anything too definitive about it. Trying to wrap your head around why the brain is such a difficult puzzle can be a little mind numbing. To master it not only would we need a map of the 100 billion neurons that make up each human brain and the 100 trillion connections between them and how those connections change from moment-to-moment, but we would also need a much better understanding of emerging disciplines like genomics, pharmacogenomics, transcriptomics, and proteomics. However there is good news as most of the scientists I spoke to acknowledge that almost all of those 10 yards have been crossed since the turn of the century, and the pace of progress is itself accelerating. Many of the people I met are in fields that didn’t even exist a few decades ago; brain stimulation, stem cell research, tissue engineering and genetic modification therapies were science fiction for my parents’ generation. What’s more, the introduction of big data and artificial intelligence will further quicken our stride and get us even closer to understanding our brains, how they develop, how they interact with the world, and all that goes wrong along the way. The complexity of it all can be frustrating, but once you start peeling away some of the layers of complexity it stops being so daunting and starts becoming a source of awe and inspiration. Attempting to get to the bottom of the neurodegeneration going on in my head has given me a newfound awareness for the beauty to be found in all the complexity of life and an appreciation for all that we have managed to uncover so far. As one of the greatest physicists and teachers we have ever had, Dr. Richard Feynman, put it…..
A big thank you to my many hosts and guides that welcomed me into their homes and helped me navigate that small but incredibly complex country; Tova and Jacky, Ella, Debbie and David, Nir and Adi, Rivka and Shimon, Snir and Shiri, Tal, Yona and Claudio, and Yael and Yaron. So long Israel, though you seem fated to be perpetually mired in controversy, you have certainly proven yourself to be a bastion of innovation. Just came back fromthe UK. I spoke alot in the orthodox community & as a reault they are opening a PD exercise and support group. thanks forthe good words about t4p.